I spent most of my time studying for my exam on Oldnetherlandish Painting. After studying up to eleven hours a day for almost two weeks, the exam itself was over in the blink of an eye. I made one mistake (I didn't read the question well enough, booh! ), but still got a 10. I worked a little on Project Management and started Cultural Heritage. Those are my study subjects for the summer. P. gave us a tour of Teylers Museum in Haarlem. Afterwards the three of us hung out at a tea room and we walked around town for a while. Roeland didn't have time to play but he did come over for dinner. And we took advantage of the nice weather for an evening stroll. We had a picknick on the beach. We saw the miniseries 'Childhood's End', after I had finished the book. I liked the book better. We spent a day in Amsterdam. I needed to do some shopping and we visited the Stadsarchive (city archives), which has exhibition spaces. We attended the Salon de Museologie. The topic was exhibitions by archival institutions. I saw some of the veggie and herb seeds I had planted turn into little plants. Bram came over. Wilma and Fred hadn't seen him since before his birthday, so Wilma had bought some (gluten free) hazelnut cake and we had a little celebration with a couple of presents. Martijn's grandmother was pretty much my grandmother-in-law for several years in the 90's. I have fond memories of our frequent visits to her and her husband. After Martijn and I broke up, his grandparents and I saw each other once in a while over the years. she passed away last month at the age of 89. I attended the funeral. We paid a visit to the garden center to get some plants for Brams little outdoor space. This was a couple of hours after my exam. Finally I had some time to relax! There was a lot of rain fall in a short period of time, which caused problems. 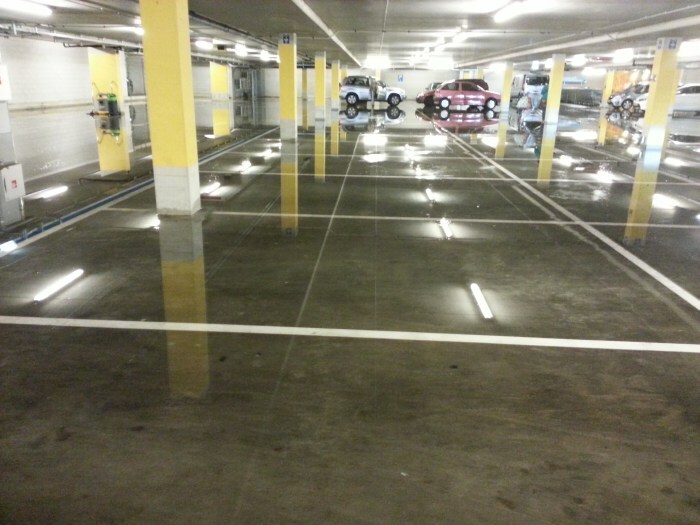 This is the underground parking at the neighbourhood mall, with the floor covered in water several centimeters deep. Bram does 'Universele Gevechtskunst' (universal fighting art); it's a fighting art focussed on self defence which draws from several types of martial arts. Once a year his club has a public demo. It was fun to learn more about the sport Bram practises and to see him take part in some of the exercises. JK and I spent a day in Breda. We bought tickets for a boat tour and then it started to rain. But at least we had the boat to ourselves, not counting the captain who told us things about locations along the route. After the boat tour we visited MOTI: Museum of the Image, which was fun. We had dinner on a bench in the park (the sun was shining by then). Bram, Bob and I held another games day. We played 'Bridges of Shangri La' (Bob won), Lord of the Rings (we defeated Sauron, but only just!) and Pickomino (Bob won). Inbetween games we had dinner, for which Roeland joined us. Maarten, Bob, Bram and I visited Duinrell. We had a fun day, despite the rain. I rode two rollercoasters, flew an airplane and did a few other rides. Later in the day we said goodbye to Maarten and headed for the Tikibad (a swimmingpool with lots of slides). We swam, hung out on the lazy river and I tried two slides. It's a 'tropical' swimmingpool but the temperature of the water and air was a little too cold for me (29 degrees celcius), especially after a day of being chilled by the rain. Maarten and I went to see the annual sculpture exhibition in The Hague, at Beelden aan Zee and Lange Voorhout.